After a delicious lunch of Korean barbecued duck and pork and plenty of ice cream and coffee in a restaurant near the Shin Kori nuclear plant, we boarded our bus and headed further south to Busan to catch the high speed train back to Seoul where we will stay one final night before our flight home Friday morning. 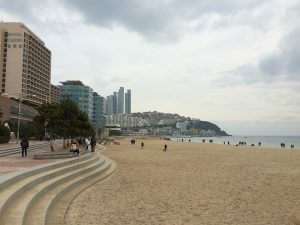 Before arriving at the train station, we made a quick stop at the Haeundae Beach area of Busan. This area is called the “new city” and is a popular summer spot for vacationers and tourists who come to see the vast sandy beach and the surrounding entertainment, hotels, and restaurants. We then crossed the Gwangandaegyo Bridge, a 7.4 kilometer suspension bridge that connects the “new city” to the “old city” sections of Busan, the second largest metropolitan area in Korea after Seoul. 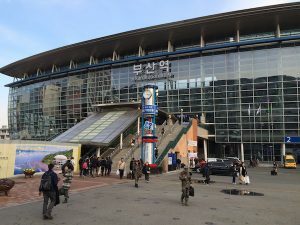 We then made our way to the train terminal, Busan Station, for our 2 hour and thirty minute ride back to Seoul Station. The high speed train lines in Korea are called the KTX lines, which stand for Korea Train Express. These lines along with many other intercity and metropolitan train services in Korea are run by the state-owned Korea Rail Corporation, or Korail. Besides the long distance high speed lines, they also run lower speed intercity ITX trains along with diesel powered regional train services and some subway services. The KTX line between Seoul and Busan which we rode, the Gyeonngbu Line, is the most heavily traveled line. Construction of the high speed lines in Korea began in 1992 and started service in 2004. Today they have allowed for travel from anywhere in Korea in less than 3 hours. The KTX lines are based on French high speed rail trains. They consist of 20 cars, 2 of which on each end are the locomotive power cars, 2 motorized units and 16 passenger cars. For many of us this was our first time riding a high speed train. The train was much like a passenger airliner, with attendants selling food and drink on carts, similar seating arrangements and amenities such as a cinema car and in-transit magazines in the seat-backs. The trip also had the sensation of flying along the ground as the train quickly took off and picked up speed, but the noise level was minimal and it was very smooth with almost no shaking or rocking. Our ears even popped with rapid changes in speed and pressure from going through the mountains. Watching the scenery go by so calmly and quickly was a truly unique experience. KTX trains have a maximum operating speed of 305 km/h, or a little over 185 mph, however the highest speed we saw was about 301 km/h according to the monitors in the car. 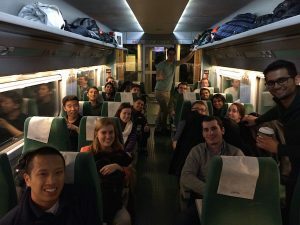 Something that was also unfamiliar to us was the cultural differences in train travel. It is good manners to not speak over a whisper and generally be reserved on public transportation. Many of us passed the time by playing high scoring euchre games, taking naps, or peacefully enjoying the Korean countryside. As our 12 day journey through Korea comes to a close, we would like to thank everyone who helped coordinate site visits and all who supported us on this trip. A special mention goes out to our incredible bus driver, Mr. Kim, who guided us to all of our destinations every day on schedule, safely and with a smile and a helpful hand loading our luggage and navigating through the congested Korean motorways. 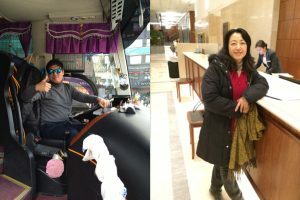 His skills in conducting three point turns, reversing through parking lots, guiding a tour bus through winding Korean mountain roads more nimbly than a professional driver in a compact car and exemplary use of horns is unparalleled. We would also like extend a very special thank you to our translator, menu navigator, and tour guide extraordinaire, Ms. Lee. Her help in translating engineering presentations, finding us places to get food and drinks, keeping us on schedule and getting to all of our locations properly made our trip the success it was. We could not have accomplished all that we did without her always being there to help and guide us. It was always great to have her smiling face teaching us about Korean culture, history, language and notable landmarks between site visits, with some singing and music thrown in as well. To them and to all who made our visit to Korea so enjoyable and memorable GLCM says, Kumsahamnida!